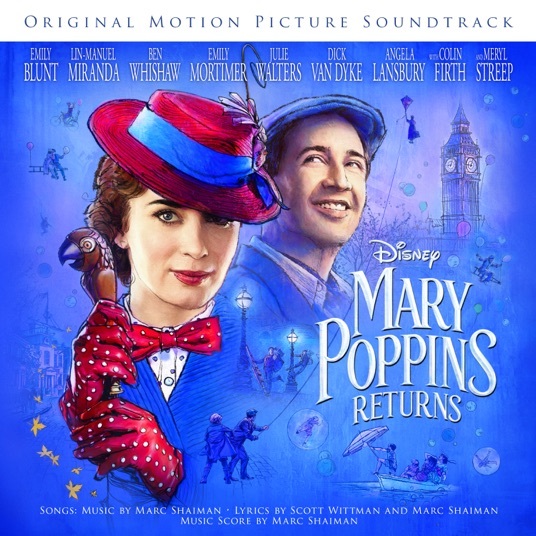 The Mary Poppins Returns Soundtrack has come out before the film and can't be compared to the original, one of the best film soundtracks of all time that came out 54 years ago. It was only a matter of time before Disney pumped out another Mary Poppins film. The work is one of the best films in their catalogue with one of the best soundtracks if not the best film soundtrack of all time. It won two Academy Awards and two Grammy Awards. Attempts for another film failed to form in the 1990's while the author of the book behind the film still alive but now with the author's passing and a new team at Disney they've been able to move forward with this latest expansion. The soundtrack to the film was released on Friday December 7, 2018. Two weeks ahead of the film release. Many are waiting for the film to come out so some of these tracks make more sense but you have to think that a great film soundtrack should be able to stand on it's own. Those who have dove in have received it well but the disappointment is clear that it doesn't live up to it's predecessor 54 years prior. Mixed reviews have greeted the film so far on Trackwave sitting at 61% of critics liking it on over 50 reviews. Most acknowledge that the songs are not bad but not as good as the original. It's hard not to think of the original when it comes to this new film and people are trying to compare this new film to that classic film. It really doesn't seem fair as it's difficult to make two classics in a row. Forgetting about the original film, the agreement seems to be that this soundtrack is very good. This is why your seeing the movie at the score it's at and not bad while still not extremely good. The soundtrack is getting hit for not having a catchy song like "Chim Chim Cher-ee" or "Spoonful of Sugar" from the original. There's an aching disappointment that the songs really don't leave a mark. Many are not remembering any of the songs from this new film and they say that they all kind of sound similar to one another. There isn't one song that stands outs. They aren't sure whether it's because it's their first time listening to them and maybe they need to listen to the songs 1000 more times to remember them. But it's been agreed that the songs are forgettable so far. Don't count it out just yet. One thing's for sure, for most people the songs aren't immediately catchy and you might not remember any of them but who knows, these are adults that are doing the reviewing, if kids decide to replay them 1000 times than maybe we could have another popular soundtrack. It seems The Greatest Showman Soundtrack had something like that happen. Most said that movie wasn't that good but the soundtrack took over and became the #1 selling album of 2018 with over one million copies sold. But that could have been an isolated case that's hard to duplicate. So far the soundtrack alone has just come out, so we'll have to see the reaction to the film and if moviegoers flock to the soundtrack for some fun or just forget about it.